5 Stars on Amazon and GoodReads! FREE Signed Book! Only 1,000 copies! The Alabaster Girl will guide you through the land of women so you can start living your life as an attractive man who is loved by women… and as who you really want to be. Get FREE* Signed Book Now! *The Alabaster Girl retails for $16.99, but we bought it for you! We have 1,000 copies to give away. We just ask that you pay your shipping / handling to receive it (just $9.95 anywhere in the world). Your information is secure and will not be shared. Yes I Want My Free Signed Copy of The Alabaster Girl! 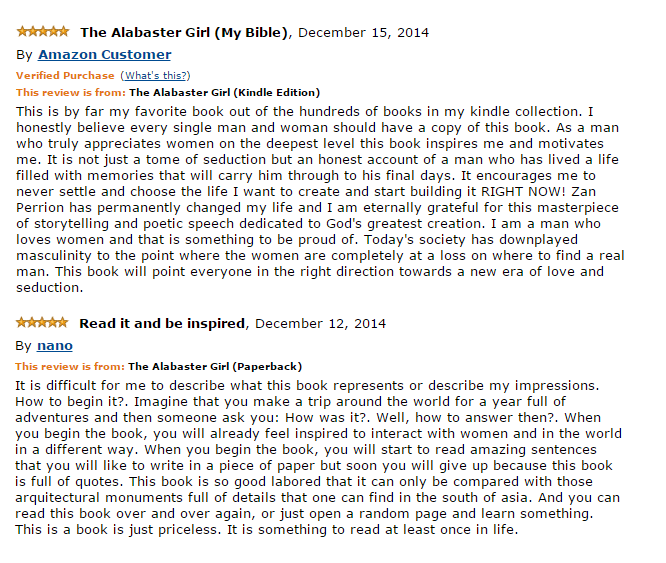 Check Out What These Influencers Are Saying About The Alabaster Girl in these videos! … to change your relationships with women and your life for the better. This probably sounds like a big promise, but your first step is rather simple and easy: to learn new possibilities about your relationships with women and about your life. And you’re at the right place to take this first step. Now… does any of the following sound familiar to you? You don’t really know where or how to meet women you want to meet. You don’t know what to do or say when you notice attractive women around you. You always end up “just friends” with women you really like. You don’t know how to interact with women in such a way that they see you more than just a friend. This much is common among a lot of men today. You’re taught to be nice — you’re taught that nice boys get nice rewards. You might have followed this little instruction all along the way — and now you have no clue about what to do around women except… being nice to them. And you might have tried to learn what to do or say around attractive women already. After all, there are tons of dating and relationship experts and gurus everywhere. Books. Blogs. YouTube videos. Online courses. But, if you’ve tried to learn “to get better with women”, did you learn something more than manipulative tricks and tactics… something that helps you attract women by being your best self? Or by understanding women and being on their side? If the idea of manipulating women puts you off, but if you still do want to become the kind of man who is loved by women, you’re at the right place. What you can do to become that man is to understand women better so you can be their insider, and to become an attractive man rather than a man who is pretending to be attractive. And there’s a book that can help you understand women better and become the kind of man who is loved by women: Zan Perrion’s The Alabaster Girl. 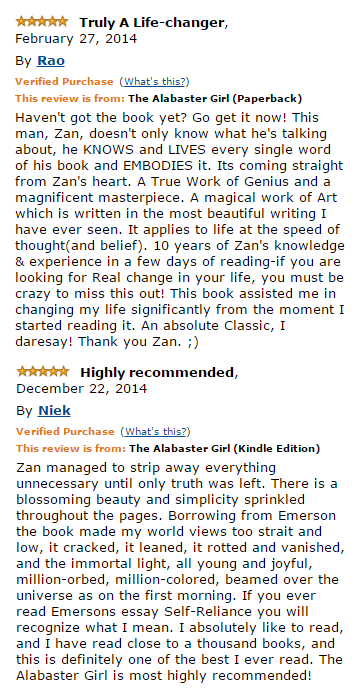 Zan is internationally recognized as one of the most original and insightful voices on relationships and seduction in the world today. The Alabaster Girl is based on the knowledge, experiences, and insights that Zan has collected over decades of interacting with thousands of women all over the world. This also means that you will have access to Zan’s wisdom without spending decades talking with women and asking questions he asked them–it’s all in this 400+ page book, and you can start interacting with women from your new perspective and understanding about them, which will help you stand out among other men. But, this is not a book on how to pick up women. It’s much deeper than that–it’s about the beauty of women. In fact, it’s not a how-to book either. The Alabaster Girl is presented with three layers: a long conversation between a woman and a man on a train ride–the woman is a journalist and she is there to interview the man–the world’s greatest seducer… about his book called The Alabaster Girl; the seducer’s reflections on the nature and beauty of women, men, love, and seduction; and stories of the seducer’s encounters with women, excerpted from the book he wrote (the book within this book. The Alabaster Girl will give you a new perspective that helps you understand women, men, and their relationships better. When you experience the world and express yourself to women from this new perspective, your relationships with women will be changed forever. Essentially, The Alabaster Girl is an invitation to a lifelong journey of becoming a man who is loved by women… and a man who seeks excellence in his life. And while quantities last… you can receive a copy of The Alabaster Girl for FREE. Ship My FREE Signed Copy Of The Alabaster Girl Now! to improve your relationships with women and to change your life forever. 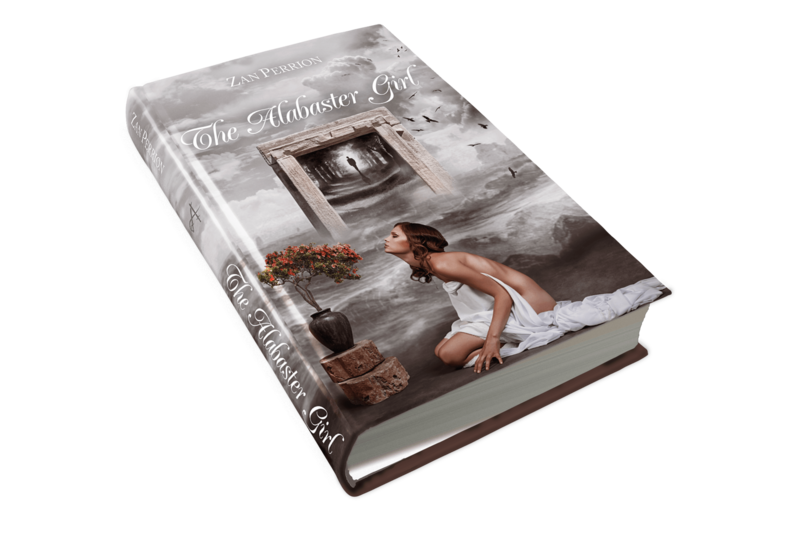 Remember… your copy of The Alabaster Girl is available for free and personally signed by Zan Perrion. All you need to do is very easy and simple. You just need to click the big blue button below. This will take you to the shipping information form. You simply fill in this form, and then you will be directed to make a secure payment of $9.95 for the shipping cost… no matter where you are in the world. You will receive a physical copy of The Alabaster Girl personally signed by Zan in three to four weeks, depending on where you are in the world. The reason why we’re offering this book for free is because we believe in the messages Zan and The Alabaster Girl deliver to the world, and we believe that you need to hear these messages so you can become the kind of man who you wish to become, a man who lives his life to the fullest and has great relationships with beautiful women around him. Again, this is an invitation for you. You may not be ready to take up the invitation. Or you may not be interested in it at all. After all, It’s a not journey for everyone. But, if you desire to have better relationships with women and to change your life, claim your copy of The Alabaster Girl now… because we are shipping printed, physical copies of the book to the world, and we only have 1,000 copies to give away. When they’re gone, they’re gone! To claim your copy now, click the button below. 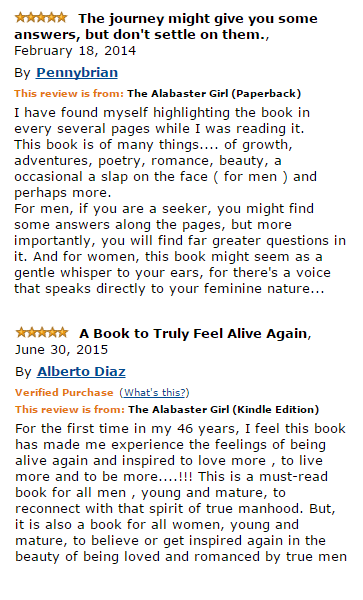 Thanks for reading this message, and we hope you’ll enjoy your copy of The Alabaster Girl. p.s. Here’s another passage from The Alabaster Girl. Imagine what your life would look like if you became a great lover of women and started making beautiful memories with them. The knowledge and insights you will find in The Alabaster Girl have transformed thousands of men, how they live their lives, and how they interact with women. If you’re interested in women, men, and the relationships between them… if you’re interested in growing up as a man and becoming an attractive man who is loved by women, then The Alabaster Girl can serve you as a great starting point for you. Again, you can get a physical copy of the book for free + $9.95 for the shipping cost. We only have 1,000 copies to give away! So don’t hesitate. Click the button below and claim your copy right now. Ship My FREE* Signed Copy Of The Alabaster Girl Now! *The Alabaster Girl retails for $16.99, but we bought it for you! to receive it (just $9.95 anywhere in the world). Your information is secure and will not be shared.